In the heat of BBQ season, this digestif disguised as a dessert sweetly refreshes your post-picnic belly. First created at Civil War Cider Co., this recipe is a nice finish to a Sunday sausage lunch or a grilled chicken dinner. Evaporating the alcohol off a dry cider leaves behind the full flavors and allows for a lovely blend with the sweet cantaloupe. The basil adds an herbal tone carried well by the cider and gently contrasts the melon. The most flavor would be lent by a still cider, but experimenting with different ciders will make this dish new every time. Try a hopped cider for added earthiness or a whiskey barrel-aged for caramel or vanilla notes. Enjoy! In a medium saucepan, bring cider to boil, then reduce temperature to simmer for 10–15 minutes. Halve the cantaloupe, discard seeds and spoon or chunk the flesh. Set aside. Turn off burner and dissolve sugar in the reduced cider. Allow cider syrup to cool to room temperature. Gently crush basil leaves to release oil and aroma. 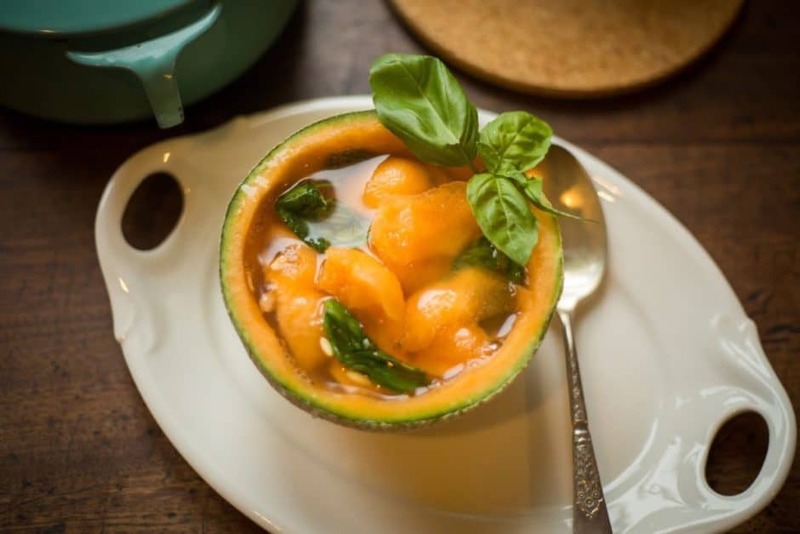 Combine cantaloupe, basil and cider syrup. Refrigerate overnight or up to 2 days to let ingredients marinate. Serve chilled with a basil garnish. Eat with a spoon. What a refreshing recipe – make a bunch and put lids on them for easy packing and service!